I got this recipe from Kayotic Kitchen, and she knows what she's doing! Preheat your oven to 400. Slice Zucchinis in half lengthwise. Spoon out the inside, leaving about 1/2". Cook your bacon in a skillet until crispy. Saute the mushrooms and onion in a skillet. When the onions are almost done, add 1/4 tsp curry powder and cook everything for an additional 30 seconds. (No longer or the curry powder will turn bitter.) When they’re done, transfer them to a big bowl. Lightly butter a baking dish and put the zucchini boats in. Fill them with your veggie mixture and sprinkle with cheese. Put them in a preheated oven, give them about 20 minutes. Sprinkle some coarsely chopped parsley on top and you’re done. You gotta try this, especially if you have been missing out on your veggies. 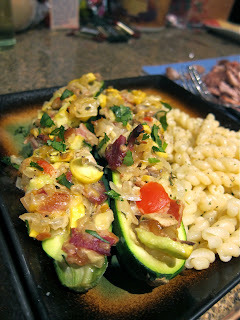 The cool thing is you can fill the zucchini boats with whatever you like! I served this with a simple butter garlic pasta.